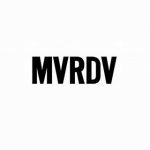 非常感谢 MVRDV 予gooood分享以下内容 。更多关于他们： MVRDV on gooood. 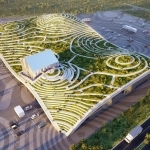 The terraces of the roof will each grow a different crop – with terraces for pineapples, rice, roses, tea, and more – with the level of each type of plant determined by the plant’s climatic requirements. The roof includes sheltered spots, benches and picnic tables that allow visitors to sit and enjoy the view. 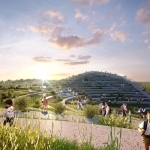 The design comprises a simple open structure with high undulating ceilings that allow for plenty of natural ventilation, with an undulating terraced green roof that is accessible from its eastern corner, where the terraces step down to ground level. The terraces will house the different products of the area. The building therefore provides an elevated platform from which visitors can appreciate the landscape that characterises this part of Taiwan. At the same time, it takes on the appearance of rolling green hills, thus becoming a continuation of that landscape. On one side, a simple four-storey structure contains the market’s administrative offices, a restaurant, and an exhibition centre where agricultural products from the region can be displayed, making the building ideal for school visits. This four-storey addition punctures the main structure, providing a secondary access to the landscaped roof. 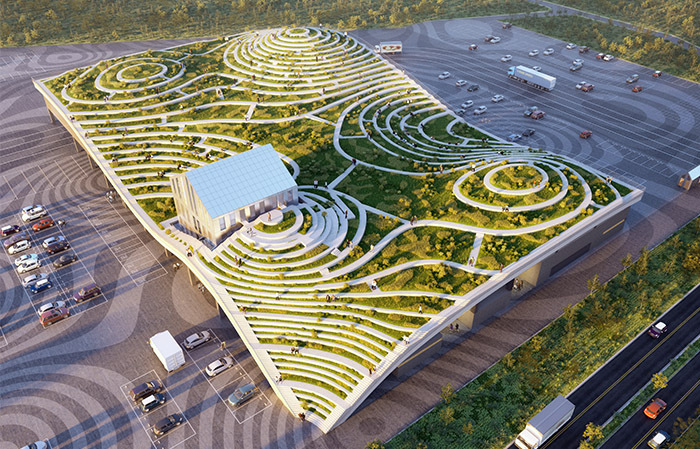 Tainan Xinhua Fruit and Vegetable Market continues MVRDV’s recent projects in Taiwan. 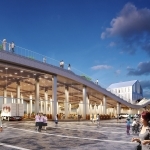 These include the Tainan Axis, which revitalises central Tainan with improvements to two key streets and a new public square with a lush green lagoon, and the Taipei Twin Towers, a recently won competition for two skyscrapers which will become a focal point in the centre of the this city. 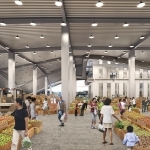 The design of the Tainan Xinhua Fruit and Vegetable Market was completed with LLJ Architects. Construction is underway, with completion expected in late 2020. Size and Programme: 80,000 m2 wholesale and auction market including 11,510 m2 roofed area (first phase) covering 180 market plots and space for auction, logistic, freezer storage and service facilities; administrative office, gates, and a roof-top restaurant. Design Team: Hui-Hsin Liao, Xiaoting Chen, Chi Yi Liao, Chiara Girolami, Enrico Pintabona, Maria Lopez, Gustavo van Staveren, Emma Rubeillon, Dong Min Lee, Jose Sanmartin, Cheng Cai, Nienhsun Huang. More: MVRDV 更多关于他们： MVRDV on gooood.